To build a movement that addresses the deep, structural forms of oppression faced by women, it is essential to build a feminism that is anti-capitalist, anti-imperialist, and on the side of all oppressed people. 2017 International Women's Strike in Santa Fe, Argentina. via Wikimedia Commons. Teachers in West Virginia, the majority of whom are women, are currently carrying out a major wildcat strike. It is illegal, breaking West Virginia’s no-strike clause. Not only are they confronting the governor and the state legislature, they are also taking on the union leadership that called the strike off three days ago. There is no better time to discuss an International Women’s Strike than the current social and political moment. Where Does the Women’s Strike Come From? International Women’s Day has a long and radical history. It was originally created by the Socialist Party in 1909 in commemoration of a textile workers’ strike in New York City. In 1910, an International Women’s Conference preceded the conference of the Second Communist International. The conference, led by socialist women such as Clara Zetkin, proposed the creation of International Women’s Day, which was observed by over a million people in a handful of countries for the first time in 1911. It is only since the 1970s that the day has been recognized by capitalist governments and institutions around the world, following the United Nations designation of March 8 as the UN Day for Women's Rights and World Peace — a far cry from the revolutionary and socialist roots of the day. It has been over 100 years since the creation of International Women’s Day and much has changed since then; in 1910 there were mass socialist organizations in Europe, and since then we have seen one socialist party after another go the way of reform rather than revolution. We have also seen revolutions end in Stalinist bureaucratization and capitalist restoration, serving anti-communist propaganda the world over. So why should we reclaim this socialist holiday in 2018, in a world that is so changed from 1909 when it was created? In the past couple years, we have seen the rise of a populist right in the form of Trump in the U.S., as well as the rise of right-wing governments in Latin America and neo-fascist organizations throughout much of the world. Yet, this is only half of the story. This political moment is one of polarization, with increasing numbers of people disillusioned by the American two-party system and questioning if capitalism really is the best system to fulfil human needs and happiness. In the U.S., the expression of this political polarization on the left is the popularity of Bernie Sanders, a self-proclaimed democratic socialist. Although Sanders is far from proposing a real solution to capitalist misery, his 13 million votes indicate that many people are searching for left alternatives. Another such expression is the explosive growth of the DSA, numbering 30,000 members who claim the mantle of socialism. Socialism is no longer a dirty word, even in the center of the capitalist empire. In this context, the International Women’s Strike seeks to reclaim and revive a 100-year old socialist mobilization for the rights of women, in particular working-class women. Another important element of today’s political reality is the emergence of a global women’s movement. In the past two years, there were massive mobilizations in Poland against an abortion ban and in Iceland for equal pay. 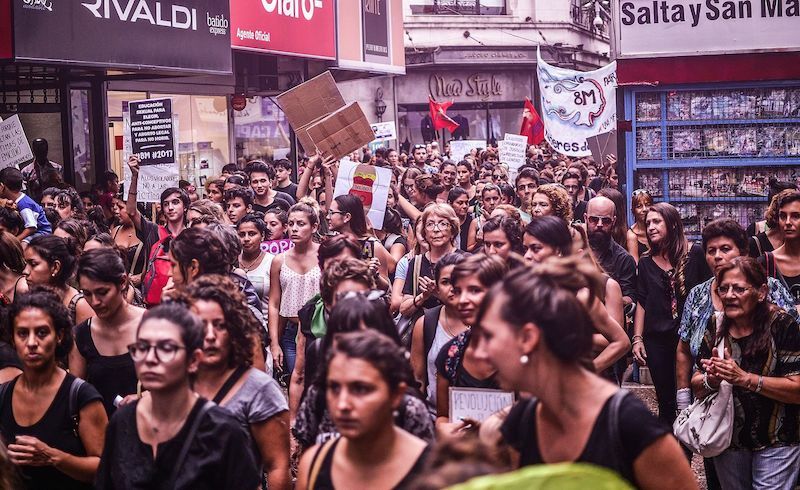 In Argentina, the #NiUnaMenos (not one less) movement brought hundreds of thousands to the streets against femicides, with the socialist women’s movement Pan y Rosas helping to organize work stoppages in a few key sectors. The January 21 protests in the U.S. are also an expression of this growing women’s movement, with hundreds of thousands of people protesting across the country against Trump’s misogyny and anti-woman policies. Even more recently, the #MeToo movement has highlighted the widespread sexual harassment and abuse experienced by women of all social classes. While the discussion in the media centered around the sexual harassment experienced by Hollywood stars, it is clear that if this happens to wealthy movie personalities, it is worse for working class women. It is especially bad for undocumented women, who stand to lose not only their job if they come forward, but also fear losing their home and lives in the US. The Democratic Party seeks to co-opt this growing women’s movement, as they have attempted to do throughout history. Although the Democrats bomb, deport, incarcerate, and support capitalist exploiters alongside Republicans, they try to make women believe that by bringing our “power to the polls,” women’s lives will get better. The Democrats suggest that our problems can be resolved by electing more women to public office. But at no moment in history have so many women held important roles in society — there are women presidents and women CEOs. More women than ever are enrolled in college and among those with graduate degrees, women outnumber men. The women’s struggles of the past have helped to toppled the laws that once barred us from these positions. Yet, the contradiction is that as these barriers have begun to crumble and the glass ceiling is broken by increasing numbers of women, the lives of working-class women, and particularly working women of color and immigrant women have not improved meaningfully. It is in midst of this contradiction that the International Women’s Strike seeks to give a political direction to the women’s movement. While Trump’s blatant misogyny was the immediate trigger for the massive response on January 21st, the attack on women (and all working people) long predates his administration. Women’s conditions of life, especially those of women of color and of working, unemployed and migrant women, have steadily deteriorated over the last 30 years, thanks to financialization and corporate globalization. Lean-in feminism and other variants of corporate feminism have failed the overwhelming majority of us, who do not have access to individual self-promotion and advancement and whose conditions of life can be improved only through policies that defend social reproduction, secure reproductive justice, and guarantee labor rights. To build a women’s movement that addresses the deep, structural forms of oppression faced by women, we need a feminism that is not aimed at breaking the glass ceiling, but rather toward organizing with the women in the basement. In this sense, it is essential to build a feminism that is anti-capitalist, anti-imperialist, and on the side of all oppressed people. In the U.S., the labor movement has been decimated and defeated in recent decades, with labor unions functioning more like businesses than organs of working class struggle and entirely subservient to the Democratic Party. In 2017, there were just seven strikes recorded by the Bureau of Labor Statistics — the second lowest number ever. Already low unionization rates are likely to get worse with after the Janus v. AFSCME Supreme Court decision, which threatens to get rid of agency fees in the public sector. In this sense, some argue that discussions of strikes are anachronistic. Others have even contended that striking is a “privilege.” We must reject this vision. The IWS invites people to engage in “strikes from waged and unwaged labor,” highlighting the hours of unpaid work that women put in on a daily basis to maintain the capitalist workforce. Yet, I want to highlight strikes from waged labor, which an overwhelming number of American women are now engaged in. Strikes from waged labor are few and far between in the US, and in many states, work stoppages are entirely illegal. Strikes are dangerous, as Lenin explains because “When the workers refuse to work, the entire machine threatens to stop. Every strike reminds the capitalists that it is the workers and not they who are the real masters — the workers who are more and more loudly proclaiming their rights.” This is as true today as when Lenin wrote these words in 1899. Capitalism runs on our labor, whether in production or in service (or reproductive) jobs. In this sense, if we want to put up a fight against the capitalist system, we must demand that our unions organize strikes for our rights. Our workplaces, the places where we directly produce profit for the capitalists, are a primary battleground — one that for too long has been ignored and deemed too difficult to organize. Yet, as I write these words, the West Virginia teachers are demonstrating the relevance of strikes, as they enter their sixth day of work stoppage, closing virtually all schools in the state — while still providing meals for needy students. The governor has promised a limited number of concessions, but the teachers know they deserve more. They exemplify the relevance of strikes as a political tool for winning our objectives, as well as for strengthening the working class and providing an example for workers around the country. It is possible to strike. In fact, it is the only way to win. These teachers are overwhelmingly women, unafraid to break the no-strike clause, to continue the strike after their union called it off and face off against the government. Likewise, women at the Hilton Hotel in Stamford, CT, who are primarily immigrant and of color, are among the most combative in a recent unionization effort. These women see struggle as the only way forward to win their demands against their bosses. They see unity with working class men, for their rights as women and as workers, as the only way forward. The International Women’s Strike, in calling for a work stoppage both this year and last, asks us to mobilize as workers, bringing the need to organize strikes back into the national conversation. But to win, we need more than conversation; we must find ways to demand that our unions coordinate actual work stoppages. Beyond the specific mobilizations that will occur in some cities across the country, the IWS has a broader political agenda, deeply ingrained in the political moment. As socialism is no longer a dirty word, and women around the world are rising up, the International Women’s Strike puts important issues on the agenda for the left, as well as for the women’s movement: anti-capitalism, a women’s movement independent of the Democratic Party, an expansive notion of women’s rights that includes anti-imperialism, anti-racism, and a combative tactic to win our rights: the strike. Far from being “ultra left” proposals by privileged and disconnected women, these demands move towards the only kind of women’s movement that can truly address the deep oppression felt by the majority of women across the world. Tatiana Cozzarelli is on the editorial board of Left Voice and a member of the DSA. She is currently getting a PhD in Urban Education.